nam wrote: The biggest items Chini export are PCs/tablet/phones, earphones, heaters etc. Fundamentally commodity items nothing high profile. We need to grab this market. Here are my export areas which we can do. 5. If possible supply chain for civilian Aircraft from Boeing+ Airbus. Need to use our market size to force these duo to make part of aircraft here. We have usual BPO+IT, Pharma & Cars. Should help us cross that 10 trillion magic figure. If we tax the components coming from China will that help in localized production ? .. much like how the cell phone production went up ? For electronics industry, depends on what you mean by components. Some we already are, like PCBs etc, giving results. Lower level components need to be handled over time and carefully, perhaps with focussed local R&D and incentives rather than just duties, or it could end up killing higher level manufacturing/assembly operations. A major push towards electronics R&D and design skills will be very productive, as that is what generates IP and is higher value/margin, and inevitably results in NPI type ecosystem along with local production if properly incentivized. The whole competitiveness of Shenzhen comes from the fact that they not only have factories but now have design skills too so companies like Anker etc who basically make simple but good products are now world leaders. In other areas, we need to move industries that make low-end items that we import from China away from cottage industry/SSI mode to large scale industry participation. It's the only way we can compete with them. For example Reliance is into manufacturing fabrics, and also retailing them (apart from footwear) in a big way. But they have no incentive to participate in the garment industry that can employ many more millions, because it is skewed in favour of smaller units regulations-wise. If companies like those are asked to set up large scale units across the country we can not only beat China at that but also leave Ban/SL etc way behind. Companies like Bajaj and Wipro have brand reputation in India and can easily engineer and locally manufacture quality basic appliances but choose instead to stamp their name on cheap imports from China. Something is wrong there, needs to be fixed and they should instead be flooding overseas markets and competing with Chinese goods. Needs focussed attention from the GOI, deregulation, and perhaps kicking some butts, it's not going to happen by just letting things drift. A simple rule like making labeling of the country of origin/manufacture on all products sold online (and elsewhere for that matter) doesn't get implemented. Half the stuff one buys on Amazon these days (even from "Indian" brands like Milton) are Chinese. There is also no excuse for importing many of the basic compounds used in the pharma industry from China, we need to get competitive there, use non-tariff barriers as there are legitimate quality issues with Chinese stuff, impose duties and force local sourcing of most of these. We would have to consider the scale. Phone components are a easy target because of the size of our market and the volume of import. Others may not. For example Chinese export heaters in large quantities. It is targeted towards colder countries. We don't need heaters, so cannot tax heaters! Given the Trump trade war, we could market ourselves as a alternative. However it can only be successful, if there is scale. If we can produce ATAGs like pancakes, it will be fairly easy to sell it abroad because it will be very cost effective. 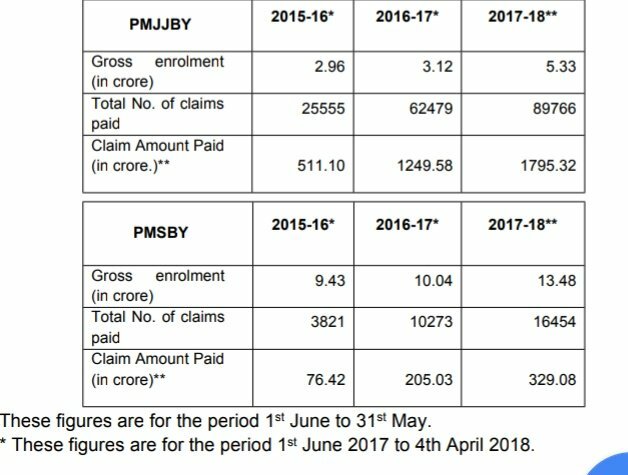 PM Suraksha Bima Yojana & PM Jeevan Jyoti Yojana. It's good that they are building a new refinery, but as with Saudi money, hope it doesn't come with other strings attached. NEW DELHI: Saudi Aramco, the world's biggest oil company, on Wednesday announced a $44-billion deal to build a giant refinery complex in India with three Indian oil majors. Maybe the many fiascos of insecure/lax data handling, as well as piss poor data security, has precipitated this action. Thanks to CA & Facebook?? Last edited by chetak on 11 Apr 2018 23:47, edited 1 time in total. Karthik S wrote: It's good that they are building a new refinery, but as with Saudi money, hope it doesn't come with other strings attached. That's actually great news., it means assured supply of oil for the refinery and at assured prices. Takes care of volatility. Also from the supplier perspective, securing the buyer secures their supplies. No, this is the best kind of investment. They invest their money to build fixed assets on our land. They can't dig it up and carry it away. They can't stop the oil without hurting themselves, because a 1.2mmtpa refinery would be the world's largest , together with Reliance Jamnagar (also 1.2mmtpa). It would sigificantly boost our trade volumes and government revenues since half the profits accrue to our state owned entities backing it. The worst kind of investment is short term hot money flitting in and out of our stock market at the press of a mouse button. Be confident that if Saudi tail needs to be twisted by India it can be done . As citizens of a great power let us not do a dhothi shiver when it comes to investment in India by countries of the heft of Saudi Arabia. Saudi Aramco signed today a Memorandum of Understanding (MOU) with “Ratnagiri Refinery and Petrochemicals Ltd.” (RRPCL), a consortium of Indian oil companies which includes The Indian Oil Corporation Ltd. (IOCl), Bharat Petroleum Corporation Ltd. (BPCL), and Hindustan Petroleum Corporation Ltd. (HPCL), to jointly develop and build an integrated mega refinery and petrochemicals complex at Ratnagiri, in the state of Maharashtra. Saudi Aramco may also seek to include a strategic partner to co-invest in the mega refinery. “The signing marks a significant development in India’s oil and gas sector, enabling a strategic joint venture and investment partnership that will serve India’s fast-growing demand for transportation fuels and chemical products. Participating in this mega project will allow Saudi Aramco to go beyond our crude oil supplier role to a fully integrated position that may help usher in other areas of collaboration, such as refining, marketing, and petrochemicals for India’s future energy demands,” said Nasser..” (RRPCL), a consortium of Indian oil companies which includes The Indian Oil Corporation Ltd. (IOCl), Bharat Petroleum Corporation Ltd. (BPCL), and Hindustan Petroleum Corporation Ltd. (HPCL), to jointly develop and build an integrated mega refinery and petrochemicals complex at Ratnagiri, in the state of Maharashtra. Saudi Aramco may also seek to include a strategic partner to co-invest in the mega refinery. ^ Near Jaisalmer sir, near Jaisalmer - like some 5 km aft towards Indo-Pak border. It should be Saudi funded. The crude is extracted in Barmer. It is a very heavy crude meaning so viscous, that you could drop crude the size of a lemon on the table and it would stay put. If you have to transport it, you would need to heat up the pipeline so the waxy crude melts a little and make transportation a little easier. Cairn India which owns the field has been transporting it to Gujarat coast so it could be exported. The extra distance in transportation and special preparation adds to The cost. The refinery in Barmer makes more sense. Last edited by Suraj on 15 Apr 2018 00:53, edited 1 time in total. The days of demonetisation seem to have returned with a majority of Automated Teller Machines (ATMs) going dry in the State. Downed shutters and ‘no cash’ and ‘out of service’ signs have become a common sight. The bankers, too, admit that there is a cash crunch. They, however, refuse to divulge the reasons and are tight-lipped on despatches from the Reserve Bank of India (RBI). “The RBI is not sharing any information with us,” says a senior banker, who didn’t want to be quoted. Though the banks are receiving cash, the despatches are not sufficient to meet the demand. “The cash being received from the RBI does not even meet half our requirement. This apart, deposits by customers have dropped drastically and the withdrawal of FDs and other deposits has gone up like never before,” he says. At many places, people were seen rushing from ATM to ATM to withdraw money. A. Narasimha Rao, a senior citizen, has been scouting for an ATM which is dispensing cash. The ATM he frequents close to his residence on Pantakaluva Road has been sporting the ‘no cash’ sign for quite some time. Also, none of the ATMs on Bandar Road was functioning on Monday. “I have been facing this problem for the past few days. The ATMs are not being replenished regularly,” he laments. Not more than 40% ATMs in the State are dispensing cash. There are about 8,900 ATMs in the State and the dysfunctional ATMs varied from 15 to 80% depending upon the bank. The ATMs of the State Bank of India (SBI), the biggest bank in the country, have also gone dry. SBI senior official Deep Chand says that 15% of the ATMs were dysfunctional. “There is a cash problem. We are trying to replenish the ATMs at regular intervals,” he says. Two wheeler export highest since 2012. Parts of UP area also reporting ATMs being dry. The job of ATM cash is outsourced to private parties by the Banks. So logically there should be no reason except someone is doing this deliberately. This has been around long before DeMo and nothing has changed. Tax buoyancy has increased post demonetisation. Supratik wrote: Tax buoyancy has increased post demonetisation. Definitely encouraging but Govt. should as a policy reduce IT rates, increase exemption limits and make it easier to file taxes. At some point, they were thinking of eliminating Income Tax but looks like the have given it up. vijayk wrote: Definitely encouraging but Govt. should as a policy reduce IT rates, increase exemption limits and make it easier to file taxes. At some point, they were thinking of eliminating Income Tax but looks like the have given it up. Why is India in this list ? Currency practices of six major US trading partners - China, Japan, Germany, South Korea, India and Switzerland - have been cited as potential currency manipulators, in part due to large trade surpluses with the United States, according to a semiannual report to Congress by the US Department of the Treasury. "Treasury found that six major trading partners warrant placement on the ‘Monitoring List’ of major trading partners that merit close attention to their currency practices," a press release summarizing the report stated on Friday. Who cares what they think . There’s a good reason legal basis does not allow someone to be prosecuted for what they are thinking of doing . Secondly, if you argue about ‘perception’ I’ll simply censure you again for bringing in politics . 1. Lower taxes for better compliance. 2. Govt. is doing everything to expand tax base and close loopholes. As they are reaching their goals, they need to reduce the tax burden. 3. Initiatives like DBT/Aadhar are reducing fraud. 4. GST expanded taxes on services and increased tax base. 5. Shouldn't citizens get rewarded for that compliance and fair taxation? Four of the five items - arguably all five - listed are already taken care of. So it's still a matter of subjective 'perception' . Fair taxation is relative. The tax in the lower bracket has been reduced. There is no evidence that Indians are taxed higher than in other countries. What can happen is that tax brackets can change with rising GDP and salary. That will happen every few years when the GDP and salaries have risen substantially. If you are expecting reductions every budget then you are living in your own world. vijayk wrote: It's not just perception. Person earning 5 lakhs/41 thousand pays 11k/year or roughly RS 900.
or 2.2 % income tax. 5 lakhs is not a low salary. Not sure how lower can the tax rate be. Please don't indulge in troll baiting. We all know who he's referring to. vijayk has a problem with comprehending the difference between politics and economics. He's a serial offender on this thread. BTVI Alert: Uttam Galva NPA Caused Problems For ArcelorMittal Bid For Essar Steel. #NCLT To Hear Arcelor Mittal, NuMetal First Round Rejection This Week. Wow, 100% recovery in a not so small NPA case. And what more, more bidders for Essar Steel means more recovery from the same. NPA resolution shaping up nicely. 5 Lacs pa is petty low amount when you have no social security, no job security, no public health care worth mentioning, no free primary to graduate education worth that is publicly funded, No pension, no house in any city where you can get a job and aged parents to take care. Yagnasri wrote: 5 Lacs pa is petty low amount when you have no social security, no job security, no public health care worth mentioning, no free primary to graduate education worth that is publicly funded, No pension, no house in any city where you can get a job and aged parents to take care. People earning under 5 lakhs probably makes up 90% of the earning population. If not more. Would GoI letting them not pay Rs. 900 per month get them all the items you have mentioned? ATMs go dry nationwide: Why the biggest cash hoarders - political parties and RBI - owe answers for the crunch? Representational image. Reuters.Representational image. Reuters. First, large scale cash hoarding by institutions including political parties ahead of the election season in crucial states and ahead of general elections next year, triggered the cash crunch. At least two senior bankers this writer spoke to highlighted this and said investigators needs to take a closer look at this possibility. This is particularly true about the Rs 2000 notes that was introduced post demonetisation, in November, 2016. Political parties may be in a hurry to collect as much cash as possible to run their operations, as cash remains king in the system despite all talks of digitalisation. Since most political parties are likely to be involved in such cash hoarding activities, only an independent probe can help dig out any hidden cash piles -- money that should ideally be in public circulation. Second, the RBI’s withdrawal of Rs 2000 notes from the system spawned the cash shortage. Last December, a State Bank of India (SBI) report pointed out that the RBI may be hoarding Rs 2000 notes to kill these bills gradually. The report cited information provided by the Ministry of Finance in the Lok Sabha that the RBI printed 16,957 million pieces of Rs 500 notes and 3,654 million pieces of Rs 2,000 notes as on 8 December 2017. The total value of such notes translates into Rs 15,787 billion. It takes into account another set of data (from the RBI), which is the currency in circulation on the same date (8 December) and subtracts the value of small value notes up to March 2017 provided in the RBI annual report from it (Rs 16,825 billion-Rs 3,501 billion). Thus, it arrives at the value of high denomination notes in circulation at Rs 13,324 billion as on 8 December. Now, taking the difference of the value of total printed high denomination currency as on 8 December (Rs 15,787 billion) and the total value of high denomination notes in circulation, the SBI arrives at a figure of Rs 2,463 billion, ‘which may have been printed by the RBI but not supplied in the market.’ According to the report, even this Rs 2,463 billion may be on the lower side. IMD's normal monsoon forecast has sent a positive sentiment across the market. Of course, India must continue focusing on improving its long term water security and usage efficiency. Rainfall is likely to be normal during the June-to-September southwest monsoon season, the government’s weather office said on Monday. If indeed the IMD forecast does pan out then it will have a salutary impact on the macroeconomic framework—especially with respect to food inflation—and mitigate some of the farm distress. Rainfall will be 97% of the 50-year average with a 54% probability that rains will be normal to above normal, the IMD said in its first stage long range forecast. Probability that rainfall will be deficient (less than 90% of 50 year average) is 14%, it added. The onset of the monsoon in June is the trigger for planting of rain-fed Kharif crops. India receives 70% of its annual rainfall in the four-month period, which in turn irrigates over half of its farm lands lacking assured irrigation. A normal monsoon is crucial to push economic growth, which slowed last year under the lingering impact of demonetisation and disruptions due to implementation of the goods and services tax (GST), both of which impacted private consumption demand as well as exports, CRISIL research said in a note. Amidst reports of a cash crunch and empty ATMs, Finance Minister Arun Jaitley on Tuesday sought to assuage fears, saying "there is more than adequate currency in circulation", even as the government blamed "unusual demand" for shortages in some areas. "There is no cash crunch in the country. There is around Rs 18 lakh crore currency supply now, which is close to the circulation during the demonetisation period. We keep Rs 2.5-3 lakh crore more currency in stock for excess demand," said S.C Garg, Economic Affairs Secretary. They collect 8000 cr in taxes from people with 5L in a year. Should have exempted.